8.30 points at 27 votes (rank 43). Somewhere in the darkest corner of the Milky Way is a small, insignificant planet named "blot". This was a really beautiful place, but the inhabitants, friendly, always good-tempered creatures who called themselves Blotians had to flee from a terrible fate. The time had come to build a generational spaceship, to go and search for another suitable planet. 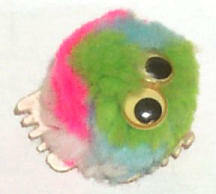 To leave the past behind, their name was changed and now they were called "Fuzzy Wuzzies". Coincidentally, a suitable planet was also found. However, this happened quite involuntarily, as they had to make an emergency landing after a collision with an asteroid, and the only planet that was within reach, was good old Earth. But it was a blessing in disguise, they landed in the Pacific near an unknown island. After the Fuzzy Wuzzies came ashore, they built a city and the island was called "The Hippest Place in The Known Universe". What the Fuzzies did not know was that demons resided on the other side of the island who, of course, always had a bad temper. It was the friendly nature of the Fuzzies that got on their nerves and they hated the new name of the island. The demons came up with a cunning plan to get rid of the existence and therefore the good mood of the Fuzzies. They invited the Fuzzies to one of the biggest party that had ever been celebrated on the island. The Fuzzies could of course not resist this invitation. They cleaned their fur and they all went to the party. But when the party was at its best, these nasty demons threw a net over the Fuzzies, captured them and locked them all up in their torture chambers. The only one who escaped these events was "Clyde Radcliffe", who left the party "slightly tipsy", and found a sleeping place in one of the bushes. The next morning he woke up with a throbbing headache and a breath so bad, he could even ignite trees with it. Nevertheless, our brave hero was ready to teach the demons a lesson and save his fellow Fuzzies from the horrible torture chambers. 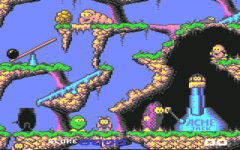 Each level of the game takes place on another part of the island. When you reache the end of a level and the respective end demon has been defeated, Clyde enters the hut of a witch. There's a sorceress inside (who has a Fuzzy-Tick), who will offer Clyde a "magic potion" which enables special skills. To prepare these potions, the Sorceress needs special ingredients. These can be found in every level in the form of "Magic Potion" creatures. It is important for Clyde that he collects as many of those as possible before he enters the sorceress' hut, so that the sorceress can prepare better potions. 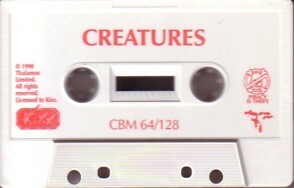 Hostile creatures can only be destroyed when they flash white when struck. Some enemies might have a connection with other enemies, which you can not see at first. They both flash white when one of them is hit. 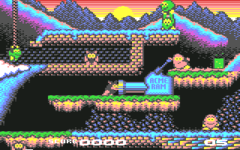 If you've completed two levels, Clyde enters a torture chamber. 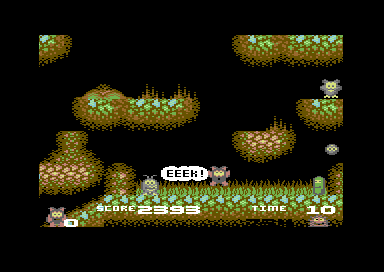 One of the Fuzzies must be freed from a fatal end before Clyde can enter the next level. Each of these torture rooms have different puzzles to solve. Paralaxscrolling with colorful graphics, good FX and some very good music. Three very diverse levels, not too easy, which are each divided into two stages with hidden extras and end demons. In the underwater sections you also have to pay attention to the oxygen supply. 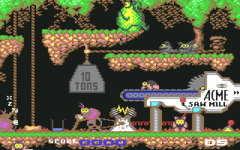 In Level 3.1 Ghosts'n Goblins (cemetery) and Cauldron are ridiculed. There are "Shops" where you can buy or upgrade weapons and buy information about the next "torture chamber". There are three quite macabre torture chambers in which puzzles have to be solved to rescue your fellow Fuzzies. You can purchase or upgrade weapons here. A weapon or upgrade will only be added to your equipment if you have collected enough "Magic Potion" creatures throughout the game. The sorceress needs those to create the weapon or upgrade if it's not upgraded to the max (grayed out). You can also buy information from the sorceress, by selecting the "i" icon. It gives you up to three hints for the next torture chamber puzzle to solve. Shoot the water tank in front of the purple monster to wake him up, to enable the elevator. The purple monster pulls it up. H.T.W: "First impression: absolutely fantastic soft Paralaxscrolling (forest level) with fine colorful graphics, good FX and some very good music, very varied and very playable, not too easy levels with different hidden extras, end bosses and funny sprites. In the underwater sections keep an eye to the oxygen supply. 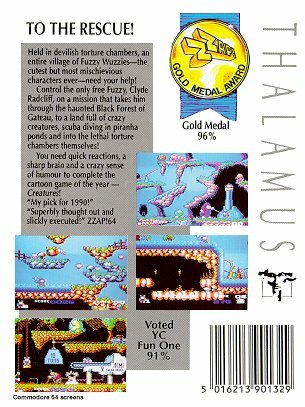 In Level 3.1 Ghosts'n Goblins (cemetery) and Cauldron (you grab a broom) are ridiculed in a great way! Then the "Shop", where you buy and upgrade weapons and pay with previously collected "Magic Potion" creatures. But the best are the "torture rooms", somewhat macabre scenes which tempt you to smile. You should have the right weapon and solve some very nice puzzles, all within the "time limit", and the intro and the ending sequence are also nice to look at..
Second impression: From Level 3.1, the difficulty is very high and the 3rd torture chamber is a bit violent, thus also a torture for your wrist. Probably for this reason a cheat mode was built in the original game. So how can you criticize this game? 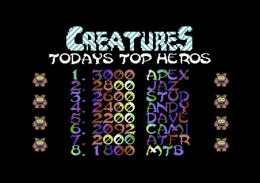 With almost nothing, only that the high score list will not be saved. I think the game is still just superb! A game that belongs in every collection". 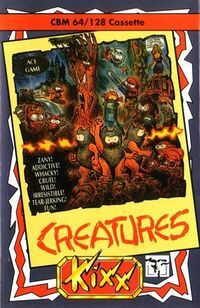 CREATURES is an abbreviation of "Clyde Radcliff Exterminates All The Unfriendly Repulsive Earthridden Slime"
For the PC there is an eponymous game, which deals with the creation and simulation of artificial life. There is no connection whatsoever with this game. When purchasing CREATURES you have adopted this Fuzzy Wuzzy automatically. The idea is that you are his mother, because it is the nature of things, that the Fuzzy sees the light of the world sees when you open the box. You can now give the little creature a name, but beware - Historical records have shown that Fuzzy Wuzzies can be quite annoyed when they're called Mildred. Please read the following guidelines to take good care of your offspring in the appropriate way. Unfortunately, there is no way this can be determined with certainty. But a rule of thumb is: If several Wuzzies are born they are female, and only one is male. No food on the planet has proven suitable for the digestive tract of the Fuzzy Wuzzies. Just experiment a little. Put your Fuzzy at a set table and watch for its reaction. Fuzzy Wuzzies love long walks in the countryside. But only if they are carried there. Since Fuzzy Wuzzies do not have an excessive urge to move and prefer to doze off in a place near you, taking care of your Fuzzy with a feather duster is sometimes appropriate. This activity is also very stimulating for your Fuzzy Wuzzy. your Fuzzy Wuzzy can be taught many tricks when growing up. Jumping through hoops is a specialty, although this will require some coaxing on your part. Beware placing sausages (no matter whether cooked, raw or frozen) in front of your Fuzzy Wuzzy, because it thinks that sausages are natural enemies and it will try to intimidate the sausage with its gaze. There is one rule that you absolutely must follow. Do not let your Fuzzy get wet, ever. It can not swim and it is scared to death! Video-Longplay level 3-1 by "Fonyi"